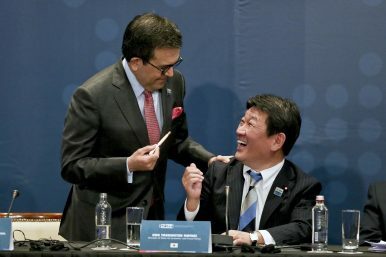 The Secretary of Economy of Mexico Idelfonso Guajardo, left, jokes with Japan's Trans-Pacific Partnership minister Toshimitsu Motegi during the signing ceremony of the Comprehensive and Progressive Agreement for Trans-Pacific Partnership, CP TPP, in Santiago, Chile, Thursday, March 8, 2018. The revived TPP 11 operates as a significant alternative to China’s approach, embodied in the Belt and Road Initiative. The Trans-Pacific Partnership (TPP) — now back from the dead — is more than a trade agreement. While its geopolitical significance and security undertones have been severely affected by the U.S. withdrawal, TPP’s project to establish U.S.-style regulatory capitalism as the dominant mode of international economic ordering in the Asia-Pacific lives on. TPP will operate a significant alternative to China’s state-centered approach, exemplified in the hugely ambitious Belt and Road Initiative (BRI). When the 11 remaining TPP parties, led by Japan, recently resuscitated the agreement, they left the terms of the original 12-party TPP largely intact. TPP11 commits parties representing nearly 14 percent of the global economy to extensive, substantive standards and domestic regulatory procedures that reflect a U.S.-oriented regulatory capitalist understanding of state-market relations in which law, mobilized by private actors, is a key institution. TPP’s rules are well suited for a business world of unbundled production and distribution, international value chains, instant communication, data transfers, and capital movements. Surprisingly, even without the U.S. as a party, some of the biggest beneficiaries of TPP will be U.S. multinationals. At the same time, TPP, along with the United States and Europe, must confront China’s $1 trillion BRI project to build maritime and overland transportation infrastructure to link China with much of the rest of Asia, East Africa, and Europe. While public debate has focused on its economic consequences for countries, TPP’s deeper significance lies in the geopolitical rivalry between the United States and China and the concepts and tools for economic and legal ordering that the two nations have championed. The fundamental contrast between the Chinese and U.S. approaches is the degree of reliance on markets and law. The major open question is to what extent developing countries in the Asia-Pacific will follow the U.S./TPP model, the Chinese state-centered approach, or some blend of the two. TPP builds on the evolving substantive and procedural requirements developed in GATT/WTO, NAFTA, and bilateral U.S. and EU trade agreements over the past 40 years. TPP is megaregulatory in scope, with substantive requirements addressing a very wide range of trade, investment, and other regulatory issues. Beyond reductions in tariffs in parties such as Japan with high duties in some sectors, TPP’s obligations liberalize trade in financial and other services as well as goods, promotes the digital economy and e-commerce, and addresses rules of origin in international supply chains, customs facilitation and intellectual property protections. TPP imposes disciplines on state-owned enterprises, government procurement, anti-competitive business practices, and corruption. Taken together, these provisions seek to promote economic integration across the Asia-Pacific region by ensuring wide space for market ordering; business freedom to locate, invest and operate; and security for firms’ investment, digital, IP, and other assets. TPP’s environmental and labor protective provisions, while not insignificant, are by comparison relatively weak. Complementing these substantive disciplines, TPP contains extensive procedural requirements that, implemented together, establish an open system of domestic regulatory governance through U.S.-style administrative law requirements of transparency, participation, reason giving, and review in administrative decision-making. These procedures can be invoked as of right by private actors including business firms and NGO. Their aim is to secure improved access for outsiders facing entrenched networks of state-business relations, and enable them effectively to engage and seek to influence administrative decision-making and vindicate their rights under the TPP treaty and domestic law. Even though the U.S. is not a party, U.S.-based multinationals will be able to take advantage of any of these procedures, either through subsidiaries or directly. Both domestically and internationally, China has pursued two seemingly contradictory strategies for economic ordering. By joining the WTO and accepting the significant reforms mandated by its accession protocol, China acted boldly to integrate its state-dominated domestic economy with the global economy as part of a strategy of state capitalism. It has encouraged its firms to participate in the international transactional markets developed and governed by Western rules, and has recently concluded a number of WTO-compatible bilateral economic agreements, aimed among other matters at protecting its burgeoning overseas investments. Simultaneously with its embrace of international market rules and business transactions, China has over the past 20 years also initiated a heavily state-driven approach to international economic ordering. Under the so-called Angola Model, China has made major investments in developing country infrastructure, originally in Africa and now also in Latin America, through loans repayable by the recipient government through the sale of agricultural commodities and minerals, accompanied by extensive acquisition of land. Conditions on financing often require hiring Chinese firms and procuring Chinese goods and labor. Now, China has embarked on the extraordinarily ambitious BRI. The “road” part of BRI is building maritime transport infrastructure from the South China Sea to Southeast and South Asia, East Africa, the Middle East, and Europe. The “belt” portion is constructing road and rail access to Central and Western Asia and Europe. There are currently over 65 countries that have agreed to participate in the project. Driven in part as an outlet for China’s trade surpluses and by massive excess capacity in its construction industries, and domestic concerns regarding Western China, the BRI aims to extend and strengthen China’s influence in other regions as well as secure economic benefits by facilitating exports of Chinese goods and creating related investment opportunities. The overall scale of the investments contemplated for BRI dwarfs past U.S. initiatives, including the Marshall Plan. Financing is being provided by Chinese state-owned banks, the multilateral but China-led Asian Infrastructure Investment Bank (AIIB), and other sources. Regulation of the investment projects will be based on negotiations by China with other governments and affiliated public/private entities and contractual conditions leveraged by China’s huge financial capacities. The venture is extraordinarily bold and carries considerable risk. The government-directed approach to international economic ordering reflected in the BRI will operate as a competitor of and a complement for TPP’s transactional markets model. On the one hand, China can use conditions on financing as a form of direct control to advance the interests of its firms and its strategic objectives. On the other hand, the economic development stimulated by BRI can also generate increased transactional activities and use of market rules by global firms, including U.S. firms. Former U.S.President Barack Obama argued that TPP would enable the United States to write the rules for trade and investment in the Asia-Pacific, that otherwise China would be doing so. At present, however, China does not stand poised to develop wholly different rules to change the basic architecture of international market-based transactional ordering. By often skirting the limits of WTO rules, China has enabled its firms including state owned enterprises to compete with great success in global markets. At the same time, China strongly opposes new international rules, like those in TPP, that restrict government freedom to participate in and direct economic activity, ensure a free and open digital economy, and require greater wholesale transparency, participation, reason giving and review in domestic regulatory administration. China’s state-centered approach to economic ordering relies heavily on government directed investment and controls, officially orchestrated exercises of market power to force technology transfer, and enlisting state owned enterprises as instruments of national policy. A looming question for the future is what legal and institutional steps China will take to leverage its BRI infrastructure investments. It will likely seek to secure preferential access for Chinese firms to business and resource opportunities in the BRI host countries, and develop related legal and government arrangements to stack the deck in favor of Chinese interests. China seems poised to support the establishment of specialized BRI arbitration centers and has established courts in China to resolve BRI-related disputes, an ironic echo of the port treaty courts imposed on China by Western nations in the 19th century. The aim is to resolve cross-border BRI related disputes in institutions within Beijing’s ambit rather than the established international system. U.S. President Donald Trump’s withdrawal from TPP will encourage China to push back strongly against the TPP model of regulatory capitalism, and pressure other countries to do so as well. The adverse consequences of Trump’s action are not, however, irreversible. Given the many advantages of the U.S./TPP approach in promoting international business operations and transactions, the fledgling TPP 11 regime can well attract additional parties and have significant influence on future economic ordering in the Asia-Pacific. Tokyo having stepped up to resuscitate the TPP, the door remains open for Washington to rejoin. If a future U.S. administration re-embraces the enterprise, this may well be a case where Humpty Dumpty can be put back together. Meanwhile, China’s BRI enterprise will generate new and controversial challenges to the existing international legal, economic and geopolitical order. In an era of uncertainty, countries across the region are carefully balancing relations with Washington and Beijing.